Reading time: < 1 minute It is taking me forever to paint and clean and settle into our new home. 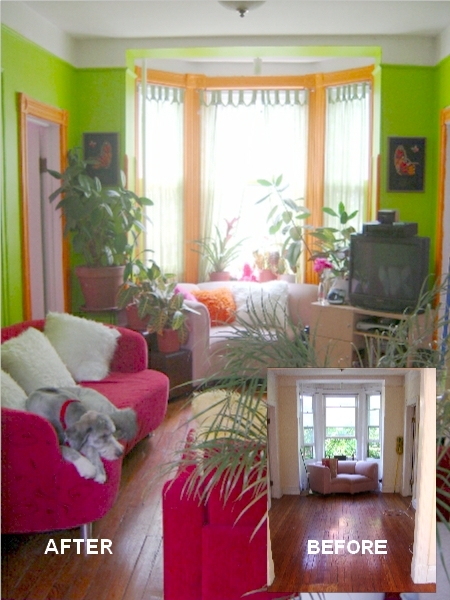 I just thought I would send up a quick BEFORE/AFTER image of our Living Room. We love happy colors!! I will be up to Casa de Hiccup in late September. My vacation is September 23-28th. Be well! I feel so intrusive looking into your home, but I randomly saw that you were an HNIA fan AND a VEGAN. Yo tambien. I wonder if the two are connected…?